Millie was born with an extremely rare form of Spina Bifida, Hydroccephalus, Epilepsy, a rare genetic disorder CHI and Millie’s first 2 years were spent in the Royal Manchester children’s hospital. During her time in hospital she contracted meningitis, septicima and many other life threatening illnesses and just 12 months ago Millie almost died from chronic lung disease. When Millie recovered from her operation, Her gran Vicky made a promise to take her Frozen-loving granddaughter to Disneyland. In order to achieve Millie’s dream they need all the help they can get to achieve their £10,000 target that would cover for Millie’s mother Emma Clarke, gran Vicky Shaw and a nurse to accompany them on their trip to Disneyland. Up until 2014 Millie had never been able to go to the park, have a birthday party or enjoy the everyday things any little girl should. 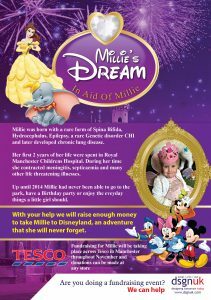 With your help we can and will raise enough money to take Millie to Disneyland, an adventure she will never forget. Supermarket giant Tesco has got involved with the brave little Oldham battler who is desperate to jet off on her Disney dream. For the next two weeks Tesco stores across the Oldham and Greater Manchester region are embarking on a huge fundraising drive. Tesco store colleagues across the Oldham,Manchester region will be shaking collection buckets, hosting raffles and running colouring competitions until the end of November to generate enough money to send Millie, on the trip of a lifetime. Local stores involved in Millie’s fundraising include the Chadderton Superstore, Oldham Extra, Failsworth Extra, Greenfield Superstore and Express stores across Oldham along with stores in Greater Manchester. If you want to offer your support to Millie please contact Vicky on 07957 732 536, or you can make a direct donation into the designated RBS account number 11013598, sort code 16-27-11.